Follow The Campanil on Facebook! A month ago, The Campanil celebrated the 20th Mills Student Strike anniversary with the Mills community by actively encouraging and facilitating Strike-themed discussions on Facebook. Strikers and alumnae recounted their experiences, posted photos, and interacted with Campanil editors. In only a few days, our fanpage gained more than 45 new likes. Here, we have gathered the very best of the comment threads that went on since May 4, 2010. Check it out! Click on the images to see. The Campanil is also selling special edition Strike issues to raise money for our Johannes Mehserle trial journalism coverage project starting this June. Some of the Strike discussions that went on on Facebook also made it into the issue! Interested? 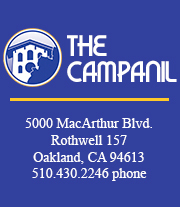 E-mail eic@thecampanil.com to pick up your cop(ies) or have them mailed to you. Each copy is $8. If you would like to donate directly to our coverage, here’s how. Thank you for your generous contribution.